On Thanksgiving Day, I walked off the turkey by exploring my mother-in-law’s yard for wildlife. Deep in the brush, I saw a warbler that I could never get a good look at, I heard and followed a rare bird that turned out to be a squirrel (I think our squirrels are silent for fear of hawks), and then finally, I saw these bugs. 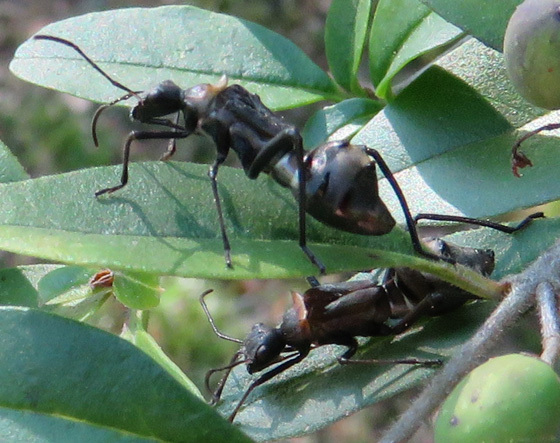 They were just hanging out on a Chinese privet bush, not hiding or moving. They were about an inch long, and didn’t look exceptionally exotic, but since they were posing a took some pictures. When I looked at the pictures on the computer, I couldn’t figure them out. They looked antlike, but they seemed too big for ants, their antennae seemed too long, their waists seemed too wide, they seemed to have little half-wings, they had spiny and bumpy projections — and when have you ever seen an ant that was just sitting there? Ants are always moving busily around — they might be backtracking, pulling a dead bug in the opposite direction their mound-mate is pulling in, or running back and forth, but it seems they are always moving. With internet help, I was able to figure out that these are Broad-headed Bug nymphs, but being as they are not yet adults, it’s not possible to identify them more specifically than that. They are plant eaters, and their superfamily is the Leatherbugs, which strikes me as a better-fitting name than Broad-headed. 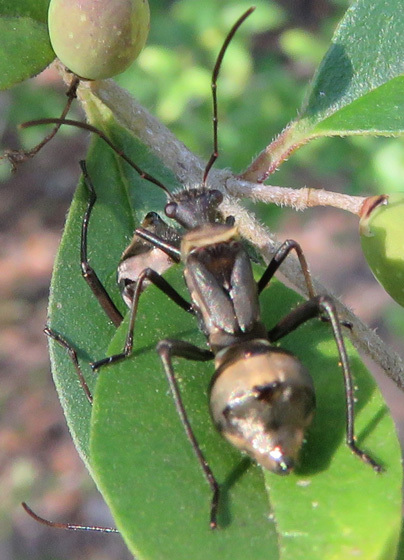 Alexander Wild has a much better picture of what looks like the same bug to me, and he also has a whole gallery of insects and even spiders that mimic ants. And while I was looking around, I found these magnificent macro images by Yudy Sauw. If you get nothing else from this blog but an introduction to Mr. Sauw, your time here was worth it! Some of those are quite odd. They look like they were designed by a committee whose members didn’t get the memo about how the parts should fit together in the end. They’d make good sci-fi movie killer creatures. They do look like weird ants. I’ve never seen them before. I love to find those too. One of these days, after I learn all the insects around here 🙂 I am going to have to start learning what bones belong to whom.